2018. 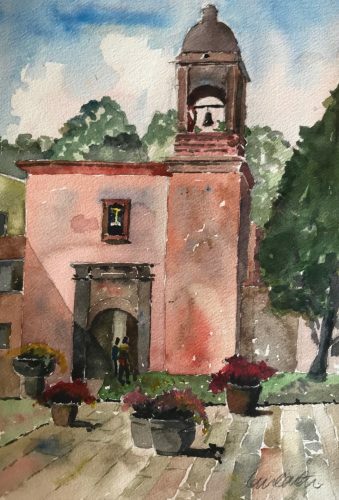 Watercolour on Arches 140lbs watercolour paper	,	14" X 11"
At first I drew and painted a small sketch book version of this capilla, and used it and a photograph to complete the final painting. It was too hot to sit on the plaza but I had the opportunity to just walk down some stairs to go outside to confirm some minor elements of the building. 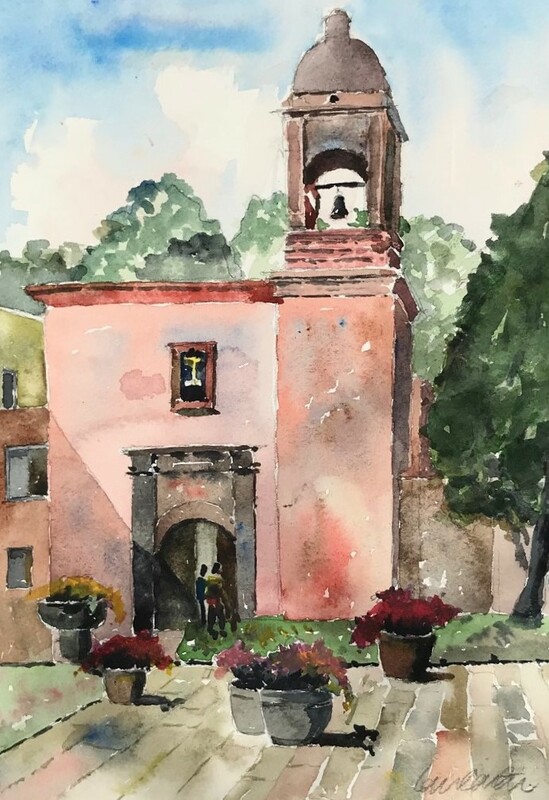 I added the two people exiting the capilla to create a focus and a sense of reality. The capilla is attached to the hotel and although there is a church within it, it also includes some rooms as part of the hotel accommodation. 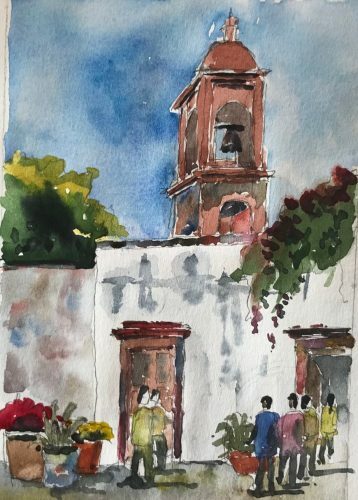 This is the second time I have painted this building. The first one shows more of the plaza and the reception area of the hotel. 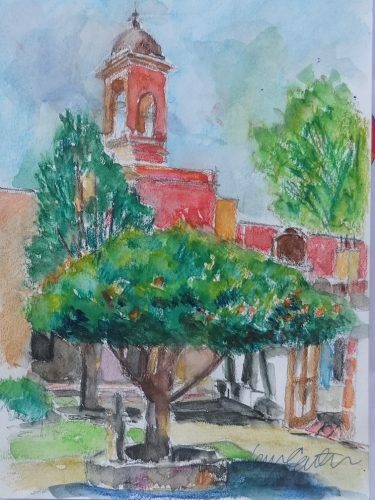 The above left is a sketch from the plaza using InkTense watercolour pencils. 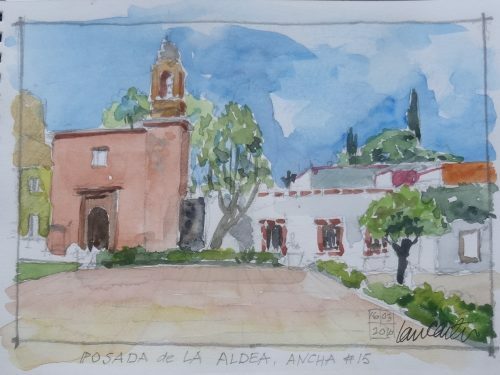 To the right is a sketch book painting from the plaza and right of that is the reverse side of the capilla from el jardin. and white, compared to the finished painting. 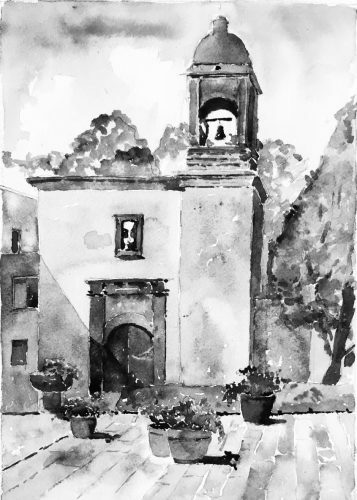 Feedback for "La Capilla de la Aldea"
Purchase Inquiry "La Capilla de la Aldea"